Advertising with Trianon Music Group offers the opportunity to reach audiences from Suffolk and beyond to raise awareness of your business or your organisation and its aims. 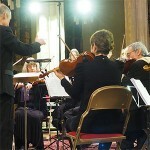 Trianon Music Group’s Symphony Orchestra and choir perform three annual concerts, usually in January, April and September in venues such as Ipswich Corn Exchange and Snape Maltings Concert Hall. These larger venues can accommodate the orchestra of about 90 musicians and choir of 100+ voices. Our three events attract audiences of up to 2,000 each year. Small groups of Trianon members perform four community concerts each year to raise funds for local projects and charities. These are usually held in small country churches and village halls across Suffolk and Essex and can attract a further 300 audience members each year. Local cultural events and festivals provide further opportunities to perform, such as Ipswich Music Day. Our current Musical Director, Christopher Green, founded Trianon Music Group in 1963. We are unique in the region in having both an orchestra and a choir. Previous Trianon presidents include Imogen Holst, who in 1965 composed an orchestral piece for the group and Sir Malcolm Arnold. The current president is John Rutter, whose music is widely known. Trianon’s audience is wide-ranging and includes all age groups, depending on the type of the music being performed. Each year we perform one concert of popular music from films, stage shows or operas, one classically focused performance and Trianon was the first local music group to introduce the Family Concert, which aims to attract all age groups. We therefore reach a variety of potential customers and we also have an active recruitment programme, which brings in new members to the group, who invite their friends and families to our events. Aspiring musicians and singers are encouraged to join our Musical Ambassadors group to promote music to a younger range of listeners. Distribution: Displayed on the Corn Exchange and Ipswich Regent plasma screens in their public areas and on the Trianon and IAA websites. Trianon uses a range of newspapers, magazines and event websites to publicise its events and the electronic image is used for these. We are delighted to offer local businesses the opportunity to sponsor our major concerts. Trianon greatly appreciates your sponsorship as it supports our aim of bringing entertainment to the widest possible audiences. It also offers you the opportunity to promote your business to a broad-based local community. In recognition of your support you receive 1 ticket and programme for the concert you sponsor. We also acknowledge your support in the publicity materials for the concert. In recognition of your support you receive a pair of tickets and programme for the concert you sponsor. We also acknowledge your support in the publicity materials for the concert. In recognition of your support you would receive 2 pairs of tickets and programmes for the concert you sponsor. We also acknowledge your support in the publicity materials for the concert and include a full-page advertisement in our concert programme for the event, which brings your company’s name to the attention of our wide and varied audience and Trianon’s own extensive membership. In recognition of your support you would receive 4 pairs of tickets and programmes for the concert you assist with. We also acknowledge your support in the publicity materials for the concert and include a full-page advertisement in our concert programme for the event, which brings your company’s name to the attention of our wide and varied audience and Trianon’s own extensive membership. We are happy to discuss tailored packages, which include the above options and additional opportunities for corporate social occasions or for entertaining clients, customers and friends at interesting and varied concerts and venues. Please contact Nigel King more information on 01473 736060. Join Trianon as a Sponsor today!